The other thing that has been keeping me busy with limited blogging time has been this “Home Party” initiative that I’m rolling out! I figured after setting up at so many venues and meeting so many wonderful customers it was time to bring the venue to them. So be it ever so humble or virtual Parties are now an option! Hosts can earn free Jewelry and have it custom made & designed specifically for them. Theme parties are also available. Celebrating a Birthday (kids & adults), Girls Night, Wedding, Graduation, Christmas, etc. Get Jewelry designed to suit your special occasion. Even cooler, make it an ART & Jewelry Party. Have a soirée, serve some appetisers, glass of wine and have a private Art viewing with your friends plus earn a discount towards a custom piece of Art. This entry was posted in Art, art discussions, Art Events, Artist, canada, Christmas, commission, creative, Etsy Shop, events, female artist, For Sale, Fort Saskatchewan, Home Parties, Home Studio, ideas, Jewelry, Make & Take, Musical Instruments, Paintings, Virtual Party and tagged Art, Art Party, Birthday kids, Bridal Jewelry, Girls Night, Home Parties, Hostess Rewards, Jewelry Party, Make & Take, OOAK, Private viewing, Virtual Parties, Wedding Party on October 30, 2014 by Amanda. “We all have to accept ourselves for who we are and not try to chase after some other approach to painting. There’s a point at which we have to stop listening to the voices of our teachers, forget what we have seen in art books and exhibitions, and just paint intuitively. 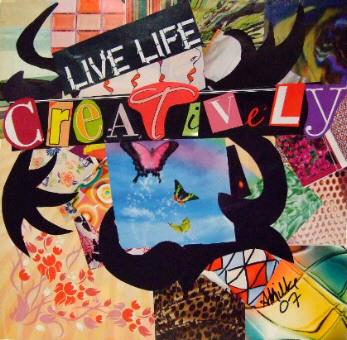 This entry was posted in collage, female artist, Fort Saskatchewan, Home Studio, ideas, Inspiration, Life, Paintings, Social Commentary, Uncategorized and tagged art quote on May 26, 2014 by Amanda. For those curious as to what I’ve been up to lately, please visit my latest project. Poems inspired by the passengers of the Edmonton LRT. I’m hoping to collect enough to warrant the publishing of the collection. Please feel free to stop in and leave a few comments. This entry was posted in Art, art discussions, Artist, canada, creative, female artist, ideas, Life, Poetry, Social Commentary, Uncategorized on August 27, 2009 by Amanda. I’ve taken a break from the “Curvy” series and started a new series focused on shoes. Why the blank? Well that’s because I’m not telling just yet. I want to see what you, the viewer might think it is. What comes to mind when you think of high heel shoes? The series will consist of 7 watercolor and ink paintings each 9″x12″ with a stiletto as the subject. And as per the norm, I was too impatient to wait for the ink to dry. This entry was posted in Art, art discussions, Artist, canada, female artist, ideas, ink, paint, Paintings, Series, Uncategorized, watercolor and tagged Amanda Milke, Art, colorful, female artist, ink, painting, paintings, paper, purple, red, shoe art, stiletto, watercolor, watercolor series on July 5, 2009 by Amanda. As I mentioned in my last post, I’ve started another watercolor & ink series. This series will consist of a watercolor background and a curvy woman inked in. is that the watercolor background also has traces of either silver or gold acrylic paint to give additional character and depth. As with my previous series “Life Simplified”, the emphasis is on simplistic beauty. The dimensions are 11″ x 15″ and as usual painted on cold press 140lb watercolor paper. Here is #2 in the Curvy series. I particularly like this one though I’m not quite sure why. Perhaps it’s the colours or the submissive yet assertive posture of the woman. This entry was posted in Abstract, Art, Artist, canada, creative, female artist, For Sale, ideas, Paintings, photos, Series, watercolor and tagged Abstract, Art, Canada, Creative People, curvy, female artist, painting, Series, watercolor, woman on July 1, 2009 by Amanda. I’ve been working on this piece for a few months now off and on. The idea came to me and I instantly knew I had to paint it. This will be the largest canvas (asides from murals) that I’ve done. It is 2ft high and 4ft long. It is like a triptych but is painted on one canvas. The inspiration came from the Biblical story of Sarah & Abraham. For those of you who might be unfamiliar with the story please see Genesis 17.
the transformation and growth that occurs when you become pregnant. All stages that Sarah might have experienced. and adds a universal quality to it as every woman who has struggled with getting pregnant can relate to some degree. As always, I’d love to hear your reflections/opinions on the piece, so please feel free to comment. This entry was posted in Abstract, acrylic, Art, art discussions, Artist, canada, female artist, For Sale, God/Religion, ideas, Paintings, photos, pregnancy art and tagged Abstract, acrylic, Amanda Milke, Art, Bible, canvas, colorful, Genesis 17, infertility, new, painting, Pregnancy, Sarah & Abraham, woman on June 29, 2009 by Amanda.